It is officially autumn and that means a couple of things, first, it was my 21st birthday on Halloween and I had such an amazing time it was unreal and secondly that it is now acceptable to wear darker makeup without looking like a goth. Not that there’s anything wrong with wearing gothic makeup throughout the rest of the year, but it’s just not a look for me. I am a huge fan of autumnal makeup and I always look forward to the day when my everyday makeup routine changes to include a brassy eye and a berry lip. Oh and purple; everything purple. I love a good purple smokey eye! This year Clarins have released a gorgeous Autumn range including further additions to some of my favourite cream to powder eye shadows! My favourite addition to the Ombre Matte Eyeshadow collection by far is this latest shade in Heather* It’s such a lovely soft purple and so easy to blend into the crease or outer corner and honestly I am loving this blended all over my eye alone with just a pop of deeper colour from the amazing Crayon Khol* in True Violet. One thing that I really love about the Clarins khol’s are that they come with a mini brush on the opposite end of the pencil instead of a sponge smudger. The brush is perfect for gently blending out the khol liner and gives it such a seductive smoke which matches these two shades absolutely perfectly and I love it! 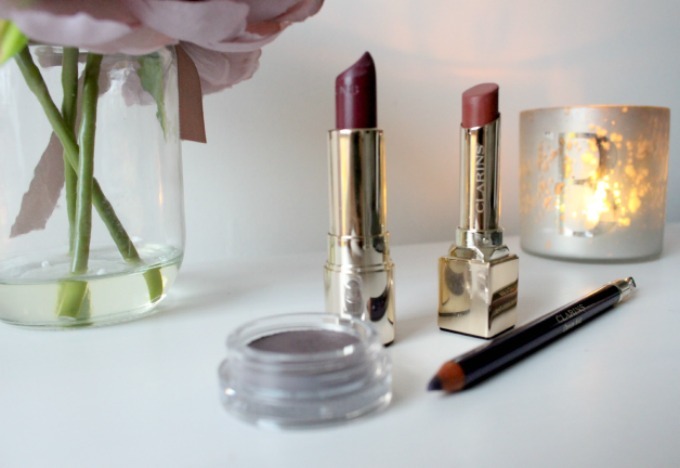 Last from the Autumn Collection bits thats I’ve tried out is this Rouge Eclat Lipstick in Tawny Rose* which to me is such an amazing dupe for MAC’s Velvet Teddy but also a lot nicer – if that makes any sense? Like colour wise this is spot on my kind of VT colour, but formulation wise it’s so much nicer, creamier and just all round a better lipstick I think. I’m a bit of a sucker for all Clarins lipsticks to be quite honest but this one has impressed me quite a bit! 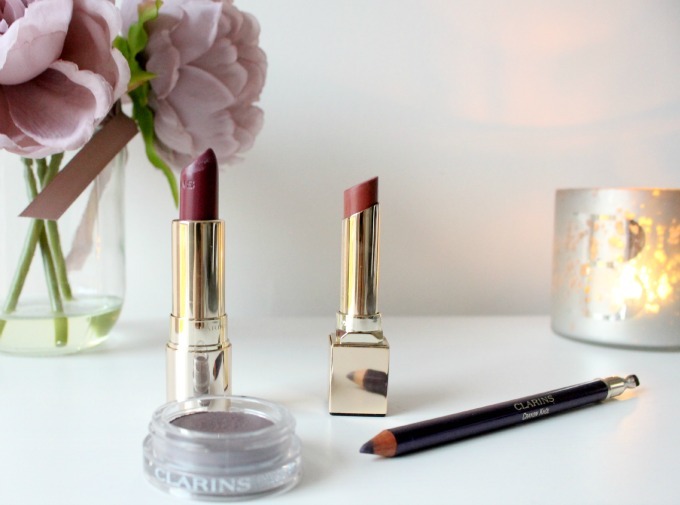 I am also literally obsessed with the Joli Rouge Lipstick collection and so when I received this beautiful Soft Plum* colour in the post after saying how much I wanted it in my last Clarins post I was so so happy! 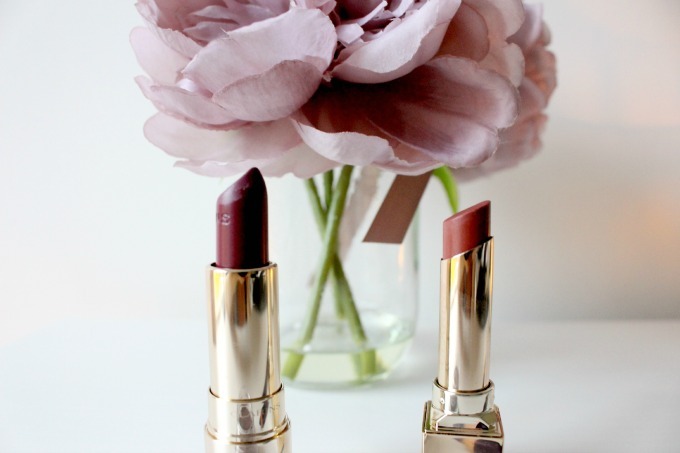 I am in love with this colour and thought I’d pop it in this post too as it’s just the perfect Autumnal colour. So thank you so much for the lovely Jenny at Clarins for sending me this gorgeous lipstick too after reading my post! What are your favourite Clarins products for Autumn?